If you want success growing potatoes, you should use only certified disease-free seed potatoes from reputable garden centers. They are normally available during spring planting time. Avoid the temptation of saving a bag of potatoes you purchased from a grocery store intending to use them for the next planting season. If you insist, however, at least dust the cut pieces with some fungicide powder. Otherwise, you may be inviting some trouble for yourself. About two weeks prior to growing potatoes, according to the planting date in your area, induce sprouting by placing them where there is plenty of indirect sunlight and where the temperature is between 60ºF and 70ºF. About two days prior to planting, slice with a clean sharp knife the big potatoes into two-inch squares. Each square should have at least one or two buds or “eyes.” You can plant small potatoes whole. Check the sliced potatoes after 24 hours, to make sure that the cut surfaces have hardened and calloused over. Those callouses will help protect the potatoes from rotting. Plant the seed potatoes immediately thereafter. The best planting time is early spring, but you should wait to plant until the soil can be worked and its temperature is at least 45ºF. If you have an unexpected moderate or heavy frost, be sure to cover the vines. If you have a greenhouse, you can grow potatoes as early as February. Choose a location with much sunshine, where the soil is loose and has low pH. If there is much clay content in your soil, add a lot of organic compost and peat moss. The amount of fertilizer you use depends on the fertility of the soil. In most cases, it is beneficial to do a soil test, and follow the report carefully. Work the fertilizer thoroughly into the soil, about twelve inches deep. Dig a ditch about six-inch deep and place the potato seeds in the bottom, with the eyes facing upward. 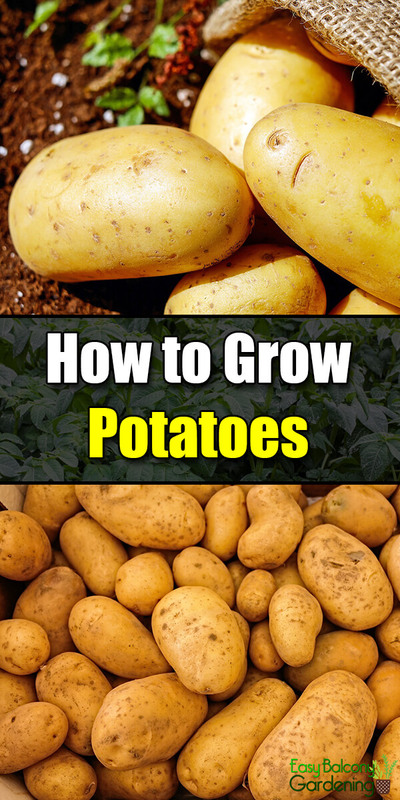 Ideally, you should place about four pieces of seed potatoes on a mound of soil. To hill up, start adding the soil around the bases of the plants. You should have about five inches high by the time the plants are about a foot-and-a-half tall. Keep adding the soil until the plants flower. This practice prevents the greening of tubers that are close to the surface. 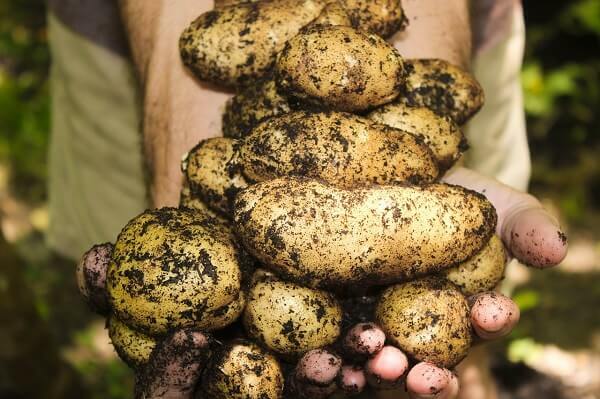 Regularly water your potato plants at least an inch of water every week. Frequently but carefully till the soil to avoid weed problems. Cultivate shallowly to avoid harming the underground tubers.